This piggy toy will arrive completely flat packed in a vacuum bag.So it is squashed when you open it.Please don't worry, it takes 1-2 days to go back to its original shape. Or you can wash it in the washing machine.Then dry it in the sun so that it will go back to its original shape soon. 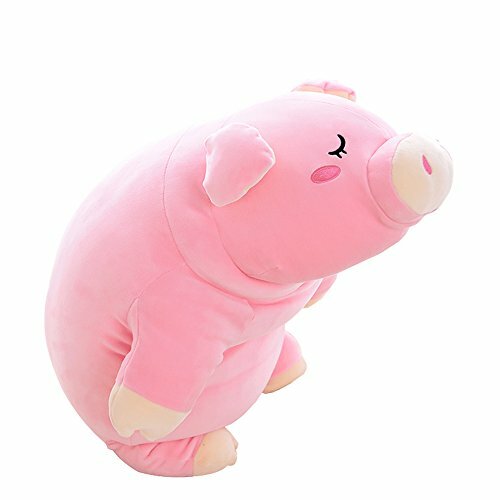 Length:18"(45cm).Made of super soft crystal fabric,and safety pp cotton.It is the plushest, friendliest, and softest stuffed animal piggy you will find. Get tons of warm snuggly happiness and cuddle up every day and night. This piggy is very adorable and soft,it will ring a big simle to the girls you love. Perfect for hugging,gifts,home decoration, party decoration,kids' toys or your female friends who love the pink adroable piggy. If you have any questions about this product by Smilesky, contact us by completing and submitting the form below. If you are looking for a specif part number, please include it with your message.